At the touch of a button: Your reflection is lit up by bright, non-glaring LED light. 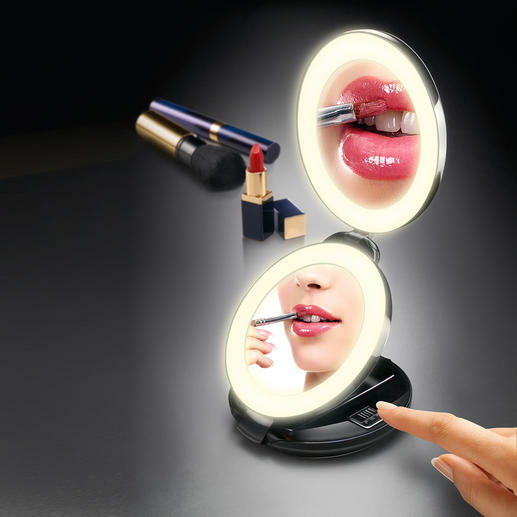 Easily converts from handheld to standing vanity mirror. Hand sized vanity mirror and 10-fold magnifying mirror. Double mirror with LED lighting. For picture-perfect make-up all the time. At home or on the go. Hardly bigger than a powder compact, this foldable 2-in-1 mirror easily fits into smaller handbags and suitcases. The lower mirror is 8.5cm (3 1⁄3") in diameter, allowing you to see your entire face and check make-up and hair. 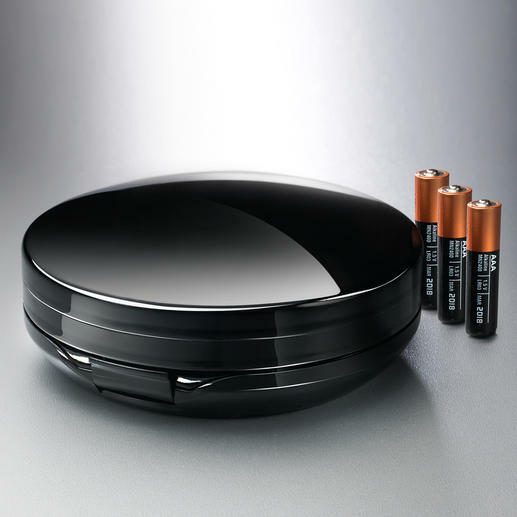 The mirror in the lid magnifies 10-fold: Perfect to touch up eyeliner and lip pencil, to pluck the finest hairs, etc. The illuminated frame around both mirrors means you can check and freshen up your make-up in low light conditions, and even in the dark. Elegant glossy black plastic case. Folded measures approx. 12 x 4.5cm (4 7⁄10" x 1 7⁄10") (diameter x H). Weighs approx. 250g (8.8 oz).